Since the beginning of year 2017, incidents related to the West Papuan independence movement led to tensions between Australia and Indonesia. The latter just recently suspended all military cooperation with Australia after materials referring to the independence movement were found at a Perth Army Base. And on 6 January, an activist displayed the West Papuan flag on the roof of the Indonesian consulate in Melbourne, arousing anew indignation in Jakarta, which now urges Canberra to take action. Indonesia's foreign minister has urged Australian authorities to act against a protestor who scaled the roof of the country's consulate in Melbourne and displayed a West Papua flag. On Friday [6 January 2016], a man scaled a wall to enter the consulate and climbed on to the roof to display the flag. 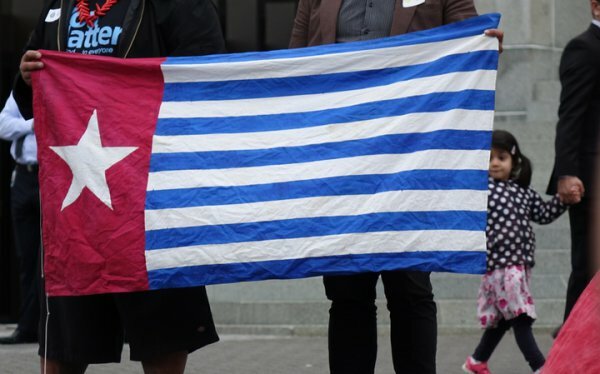 Raising the West Papuan Morning Star flag is a crime in Indonesia punishable with years in prison. In a statement, the foreign minister, Retno Marsudi, said Australian authorities must investigate the 'crime perpetrator', describing the intrusion as absolutely intolerable. She said she has been in touch with Australia's foreign minister, Julie Bishop, about the incident. Last week, Indonesia suspended military ties with Australia in a spat over materials at a Perth Army Base that included reference to the independence movement in West Papua. The West Papua issue is a sensitive topic for Jakarta, as the easternmost province has been the scene for a low-level independence movement for years.